Last month, I shared a great story about an individual served by Imagine! who is volunteering to assist others in need. Today I’d like to share two similar stories, offering more evidence of the fact that individuals with intellectual disabilities can and do make remarkable contributions to their communities every single day. In January of 2011, the Work Experience program disbanded. Jordan’s job coach talked with the library staff and asked if he could continue working there as a volunteer. The library agreed as long as Jordan’s mother is present while he volunteers. 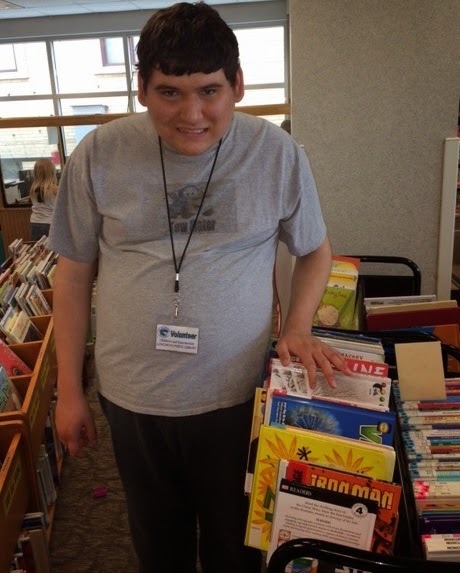 “Jordan and his mother have been an invaluable asset to our library. We just love when they come,” said Elektra Greer, Jordan’s library supervisor. Elektra works in the children’s section and has overseen Jordan’s work since he started. She feels Jordan’s involvement is a testament that they are a public library and inclusive to the community. Jordan arrives, signs in, puts on his volunteer badge, and immediately walks over to the book cart. “It’s great for his self-esteem to have something he can own and give him a sense of accomplishment,” said Debbie. “For us, it has definitely been a win-win,” said Elektra. And here’s another inspiring story of someone served by Imagine! who is volunteering to make the world a better place. I have written about Carl before, when he traveled to New Orleans to help repair homes damaged by Hurricane Katrina. Well, Carl is still at it, this time helping neighborhoods recover from Hurricane Sandy. From May 5 – 9, Carl, along with fellow parishioners from First Congregational Church in Boulder, traveled to New York and worked with the Tunnel to Towers Foundation in Staten Island to help rebuild homes that were damaged by that devastating storm. The group stayed at a Moravian Church in Great Kills, Staten Island, and worked on two sites. One of the sites had been repaired after Sandy but received new damage due to a flood that occurred just a couple of weeks ago. 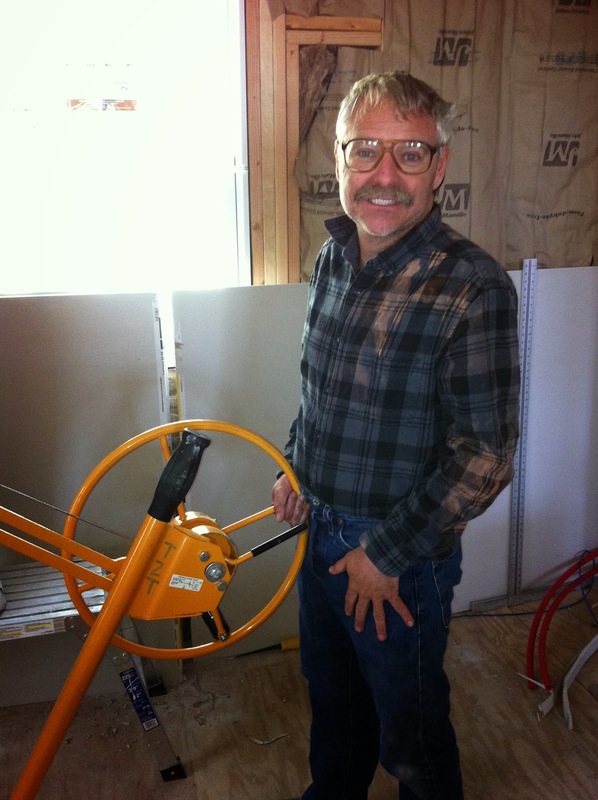 Carl is pictured using a sheet rock lift in one of the homes in which they worked. This was a device that several members of the group had never worked with before. Carl lifted and lowered the sheet rock several times. He worked on installing insulation, screwing in sheet rock, cleaned up the house, and, of course, recycled. He picked up bottles and cans wherever the group was and he returned them to the local grocery stores for a refund. Thank you Jordan and Carl, I am humbled by your commitment to serving others. Today’s Labor Source 30 for 30 partner highlight: Timberline Mechanical. Timberline Mechanical is the leading provider of commercial and industrial heating, ventilation, air conditioning , and refrigeration (Boulder HVAC / HVACR) services in Boulder, CO, and throughout the Colorado Front Range. Timberline is recognized for its intelligent, sustainable solutions that keep HVAC equipment running efficiently and at peak performance. Over the past year, Timberline Mechanical has employed ten CORE/Labor Source participants at various times. Timberline Mechanical has been employing individuals served by Imagine! since 2012. Thank you, Timberline Mechanical, for your commitment to our community and for providing employment opportunities for individuals with intellectual disabilities. For those of us who live in and around Boulder, Memorial Day weekend is kind of big deal, with one of the largest and most innovative running races in the world taking place: the Bolder Boulder. This year, even if you aren’t a runner or don’t live in the area, you can participate and help support individuals with intellectual disabilities in staying active and participating in their community. Beyond Limits, a Bolder Boulder running team comprised of dozens of volunteers and individuals with intellectual disabilities, including many individuals served by Imagine!, is one of only three finalists for the I AM BOLDER story contest. The winning story, as determined by an online vote, will be announced on race day in Folsom Field to 50,000 Bolder Boulder fans! I’d like to encourage you to watch the short video below about Beyond Limits (featuring several folks served by Imagine! ), and then click here to vote for them to be the winning story. You can learn more about Beyond Limits by reading this news article. Voting ends Sunday, May 25 at 5 pm, so don't wait too long! 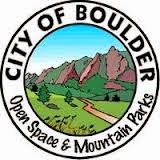 Today’s Labor Source 30 for 30 partner highlight: Boulder Open Space and Mountain Parks. Boulder's Open Space & Mountain Parks are a very special place. The lands teem with native plants and wildlife and are home to threatened and endangered species. They serve as a buffer between Boulder and nearby development. They sustain agriculture uses and add untold benefits to the natural environment - clean air, water, and earth. The lands shape the urban mosaic of the Boulder Valley and provide citizens with passive recreation opportunities. Trails are used by walkers, hikers, bicyclists, horseback riders, dog walkers and other passive recreational uses. Over the past year, the Boulder Open Space and Mountain Parks has employed seven CORE/Labor Source participants at various times. Thank you, Boulder Open Space and Mountain Parks, for your commitment to our community and for providing employment opportunities for individuals with intellectual disabilities. 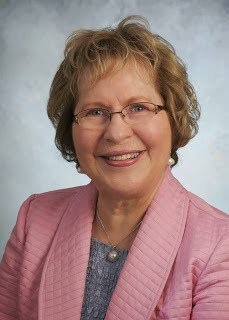 Today I’d like to offer my congratulations to Leona Stoecker, a great friend of Imagine! who has been awarded the prestigious Stan Black Award by the Community Foundation Serving Boulder County. Leona has developed a very personal relationship with the residents and staff members at Imagine!’s Charles Family SmartHome. She often rides her bike over to the SmartHome with home-baked cookies to share. When she heard that the SmartHome needed a dining room table, she found a beautiful table top at a consignment store, persuaded the owner to donate it, and then found someone to make the table legs! Because of the deep connection she has with the SmartHome’s residents, she has played an integral part in raising community awareness and funding for the facility. A perfect example is the day she spent at the Charity Hole of the Longmont Chamber’s Commerce Cup Golf Tournament in 2009. As each cart rolled up to the hole – for five hours straight – Leona greeted each foursome with a brochure and a story about Imagine! and the Charles Family SmartHome. Because almost every player already knew and respected Leona, she was able to gently but enthusiastically encourage each person’s support. That event and countless other meetings with potential donors, talks to groups, and scores of SmartHome tours that she set up, accompanied, and often led (34 tours to date involving 179 individuals!) have resulted in critical funding being raised. Thanks in great measure to her efforts, nearly $1,180,000 has been secured for the Longmont SmartHome to date, despite the very tight economy. Congratulations, Leona! We are so fortunate for your support and incredibly grateful for your hard work on behalf of the individuals we serve. Today’s Labor Source 30 for 30 partner highlight: Triad Technology. Triad Technology is the leading supplier of instruments and accessories used in Atomic and Molecular spectroscopy. Their goal is to provide spectroscopy tools at a reasonable price that meet project needs. They supply Precision Wavelength Reference Cells, Custom Optics and Glassware, External Cavity Laser System Tunable, Solid State Diode Laser and Devices for working with Cold and Ultra-cold Atoms. Over the past year, Triad Technology has employed four CORE/Labor Source participants at various times. Triad Technology has employed individuals served by Imagine! since 2008. Thanks to everyone at Triad Technology for their commitment to our community and for providing employment opportunities for individuals with intellectual disabilities. You may be familiar with the book “All I Really Need to Know I Learned in Kindergarten,” by Robert Fulghum. The book offers the simple piece of wisdom that the most basic aspects of life, the ones we learn early in life, are the ones that bear its most important opportunities. The very first of these aspects listed in Fulghum’s book is “share everything.” Now, that concept is simple when you are talking about tangible items. If you bring a piece of candy to class, you should bring enough for everyone (I know candy probably isn’t usually allowed in class, but you get the point). But what happens when we aren’t talking about objects, and instead, we are talking about ideas? How do you share those? I’d say that in 2014, social media has become the conduit for sharing ideas with everyone. I have long argued that social media is a must for organizations serving individuals with intellectual disabilities, both from an organizational standpoint and from an individual standpoint. I continue to believe that, and my belief continues to get reinforced. So in that spirit, today I’d like to share with you a few videos that have come across my virtual desk recently. The videos are interesting and/or inspiring, and definitely worth sharing. The first two videos were first shared with me by a member of the Imagine! Foundation Board of Directors. This one features a couple of brothers, and the amazing way they support each other. This one features a truly inspiring woman, Heeah Lee, who was born with only two fingers on each hand - yet plays the most exquisite music on the piano. This next video is a little different. It was created by an Imagine! employee, designed to remind those of us who work here how far society has come in terms of providing services for individuals with developmental disabilities. This change over time occurred in large part because of dedicated individuals, families, and employees of organizations like Imagine!. Sometimes we can get so caught up in the day to day aspects of our jobs and our lives and forget to reflect on what we have truly accomplished. It is good to get a refresher. Alas … if I had attended kindergarten, my kindergarten teacher would be so proud. The group also writes and presents on a case study tackling a complex issue facing Imagine!. 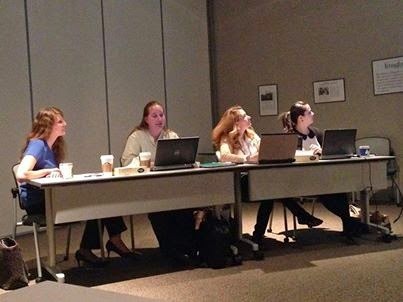 Two weeks ago, participants in the 2013-2014 Leadership Development Program, Katie Edwards, Anna Knott, Carla Rapp, and Laurel Reese-Scott (pictured above), gave their case study presentation to Imagine! 's Executive Team and others. The case study covered this topic: Imagine! has embraced technological progress, incorporating technology and systems use throughout the organization. This growth has brought to light some challenges and a possible division between employees and the technology they are being required to use. Devise a method of finding how deeply this goes into our workforce and propose a better method of mitigation. You can tell the team put a great deal of effort into their case study. The group’s written report and presentation were well researched and thoughtful, and their recommendations gave Imagine! 's Executive Team plenty to think about as we continue to move forward with our use of technology to make us a more efficient and effective organization, capable of delivering superb services. Great work Katie, Anna, Carla, and Laurel! I’m proud to work alongside you all. 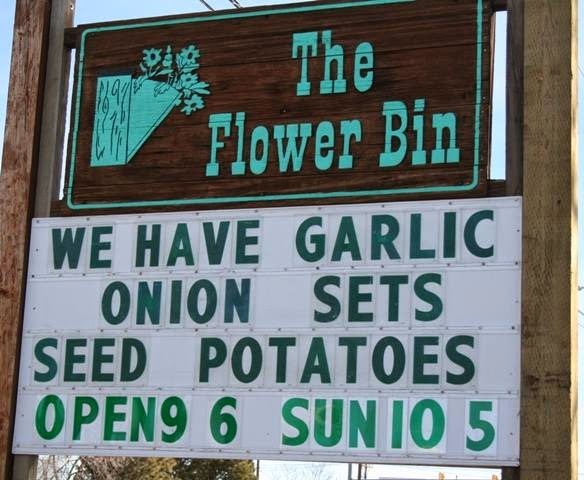 Today’s Labor Source 30 for 30 partner highlight: The Flower Bin. There is a trend that has grown into a full-fledged movement. Buy Locally seems to be the well-deserving bandwagon that socially and environmentally-conscious people are jumping on. The Flower Bin has lived and promoted this ideal for years and years by growing its own plants -- 43 years to be exact. From the corner of Nelson and Sunset in Longmont, the 'Bin has been helping gardeners of all ages and experience levels fill their gardens and homes with locally-grown options for any occasion. The Flower Bin has demonstrated an unwavering commitment to their customers and the community that they live in, support, and help beautify. Over the past year, The Flower Bin has employed 6 CORE/Labor Source participants at various times. The Flower Bin has employed individuals served by Imagine! since 2008. Thanks to everyone at The Flower Bin for their commitment to our community and for providing employment opportunities for individuals with intellectual disabilities. Last Saturday saw some scintillating SmartHome v. SmartHome Softball. More than 30 spectators showed up to see the “Silly Crazy 8s” (residents of Imagine! 's Bob and Judy Charles SmartHome) take on the “Longmont Trouble Makers” (residents of Imagine! 's Charles Family SmartHome) in softball. The game was an epic battle which ended in a 4-4 tie. More than a dozen volunteers from CU’s Alpha Kappa Psi, a coed professional business fraternity, helped out with making the game a fun experience for all. The game even included singing of the national anthem at the beginning, a play-by-play announcer, and a rousing version of “Take Me Out To The Ballgame” between innings. Below are some pictures from the game, but they only go half the way in showing how enjoyable the event really was. By all accounts, everyone had a great time. Thanks to the many staff members of both of Imagine! 's SmartHomes for working so hard to make the game a success. I don’t think I will create much controversy if I make the statement that “Calvin and Hobbes” was one of the best, if not the best, comic strips of all time. For the three of you out there who have never heard of it, the strip followed the humorous antics of Calvin, a mischievous and adventurous six-year-old boy, and Hobbes, his tolerant and much wiser stuffed tiger. In my opinion, much of the success of the strip derived from Calvin’s mischief making. The “real world” confounded Calvin, and he not only preferred his own private version of reality, but went out of his way to try to make the real world fit into his own particular version of reality. Often his efforts conflicted with the many authority figures in his life, who were exasperated by his efforts to shape the world to fit his needs. But we readers would delight in his antics. I think most of us feel a certain affinity with Calvin. We’d like to make the world bend to our needs. Calvin’s mischief making often exposed the absurdities of the rules (both explicit and implicit) that we all face in our everyday lives, often to the point of frustration. Calvin’s antics pushed the envelope while never leading to any real harm (other than the sting of the occasional snowball to the head). They were creative and attracted attention to the little injustices in life. I think most of us secretly wish that we were brave enough to go beyond the boundaries as often, and as enthusiastically, as Calvin did. But few of us do. I think those of us in the field of serving individuals with intellectual disabilities could use a little more Calvin-style mischief. We need someone brave enough to draw attention to some of the absurdities that govern our services, as well as to the possibilities that may exist beyond what we are doing now. Someone willing to expose and explore the alternatives. Someone who knows the rules but also knows when, where, how, and why to step outside of those rules. Is there risk in mischief? Yes, of course. But the rewards are potentially far greater – better services, more people-centered options, and greater freedom and independence for those we serve. In our world, it seems like it is not OK to engage in a little mischief. I think it should be OK. We all need to lighten up a little and indulge our inner Calvins a bit more. The results could be surprisingly productive.